Four Iowa congressmen issued statements shortly after President Obama announced the world’s most-wanted man had been killed in a U.S. military operation. Des Moines, IA – Congressman Leonard Boswell released the following statement after President Obama announced the death of Osama bin Laden. WASHINTGON, DC- Congressman Loebsack issued the following statement after President Obama’s announcement that Osama Bin Laden has been confirmed dead. Neither of Iowa’s U.S. Senators issued statements Sunday evening, nor did Congressman Steve King. Wagons are already circling — way before the state legislature takes a vote on a reapportioned map of Iowa’s congresional districts (as well as districts for Iowa House and Senate seats). As you may recall, the first map unveiled last week would pit two Democratic congressmen (Bruce Braley of Waterloo & Dave Loebsack of Mount Vernon) in the new firt congressional district. Congressman Leonard Boswell also has agreed to host a fundraiser for Loebsack in…wait for it…Jasper County. Jasper is in the current third congressional district, which Boswell now represents, but it will be in the new second congressional district if the redistricting plan is approved. See headline above. Read statement below. The redistricting plan for Iowa’s congressional and legislative districts was released this morning. It pairs Congressmen Tom Latham of Ames and Steve King of Kiron in one district. They’re both Republicans. It pairs Congressmen Bruce Braley of Waterloo and Dave Loebsack of Mount Vernon in another district. They’re both Republicans. It is possible, no probable that if the Iowa General Assembly approves this plan that two of those aforementioned congressmen will move. Latham has moved before. Loebsack could move into Johnson County, the Iowa City area. In the last reapportionment, then-Congressman Jim Leach moved from Davenport to Iowa City. And Congressman Leonard Boswell moved from Davis City to Des Moines. It will be a few hours before the full extent of pairings in state legislative races for House and Senate seats is known. Three of the seven members of Iowa’s congressional delegation emailed me responses to President Obama’s speech last night. Read them below, in the order they were received. Last week Rep. Braley sent a letter to President Obama asking for a full accounting of the Libyan conflict and the costs to taxpayers. Speaker Boehner sent a similar letter to the President. Rep. Braley has previously called for a full accounting of the human and financial costs of the wars in Iraq and Afghanistan. Below is a statement from Senator Chuck Grassley regarding the President’s speech tonight about U.S. military involvement in Libya. “I was an early advocate of a no-fly zone. Today, despite the President’s delay in offering this help, the Libyan opposition has made progress in defending itself against the brutality of Gadhafi, thanks to the strength and capability of U.S. military forces. “The burden remains on the President to convey how he sees the mission of the United States going forward. What is the long-term commitment of the United States in supporting the effort that now is NATO led? If America’s armed forces are put in harm’s way, what is the objective, if not regime change? How long does President Obama envision our involvement, should Gadhafi hold on? WASHINGTON, D.C. – Senator Tom Harkin (D-IA) released the following statement on the situation in Libya and the President’s national address this evening. “It is tragic to see Colonel Gaddafi continuing to ignore the will of his people and continue his brutal crackdown. Based on those humanitarian atrocities, I was supportive of the initial UN-backed military strikes. But with the U.S. ongoing military presence in Iraq and Afghanistan, I have concerns about an open-ended engagement in Libya. “Tonight, President Obama rightly addressed a skeptical public about this mission. I believe that while there is merit in handing over operations to NATO, ultimately, a political solution is needed to end the conflict in Libya. “When ObamaCare passed, I made a pledge to work to uproot the law from the U.S. Code. 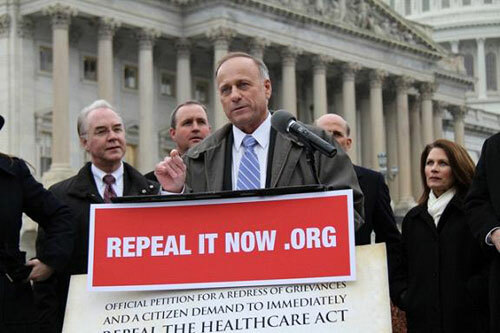 To fulfill this promise, I drafted and introduced language to repeal ObamaCare ‘as if such Act had not been enacted.’ Today, the House of Representatives passed this language, and we are one step closer to fully repealing the law,” said King. An Arizona congresswoman was shot in the head today as she held a town hall meeting in Tucson. Congresswoman Gabrielle Giffords has a link to Iowa. Her brother, Alex Giffords, was Iowa State’s kicker from 1979-1982. Initial reports indicate five people were killed. A federal judge and a nine-year-old girl are among the dead. The congresswoman is among perhaps as many as 10 other shooting victims. Doctors say they’re optimistic about her chances for recovery. Congresswoman Giffords was among the members of congress who read the U.S. Constitution aloud on the House floor this past week. She read the First Amendment. “While we still don’t have all the details, Carolyn and I are praying for Gabby. Our thoughts go out to her husband Mark, her family, her staff and all who know and love her. And I add my deepest condolences to the families of the other victims of this morning’s tragic, senseless shooting. “Kathy and I are keeping Congresswoman Giffords, her staff, her family and the other victims of today’s senseless tragedy in our hearts and prayers. I know Congresswoman Giffords to be a dedicated servant to her constituents and the cause of democracy in the United States. WASHINGTON, D.C. — Senator Tom Harkin (D-IA) today issued the following statement after learning that 18 people had been shot and six died at a public event in Arizona. U.S. Representative Gabrielle Giffords (D-AZ) remains in critical condition and U.S. District Court Judge John M. Roll is among those who were killed. Washington D.C.- Congressman Steve King (R-IA) released the following statement after United States Representative Gabrielle Giffords was shot during a public event in Tuscon, Arizona today. Mayors, governors, senators — oh my! This is a sort of Friday potpourri post, covering everything from the controversy swirling in Washington to the potential ’12ers who will be in Iowa soon. In case you missed it, short-time Governor Chet Culver and Des Moines Mayor Frank Cownie have issued statements in support of President Obama’s deal with the GOP on taxes. (Cownie endorsed Obama before the ’08 Caucuses.) The chair of the Iowa Democratic Party took a slightly different slant than her two Democratic counterparts. And Congressman Bruce Braley is the only one of Iowa’s three Democratic congressmen to issue a written statement on the subject. Braley hints he’s dismayed by the deal, but doesn’t come right out and say it. You can read all of those statements below. Des Moines Mayor Cownie issued the following statement in response to President obarna’s economic incentive package for America’s middle class families. WASHINGTON, D.C. – Governor Chet Culver today said he supports President Obama’s efforts to extend unemployment insurance, tax cuts for working families and other tax incentives. Culver, who is in Washington, D.C., as the chair of the National Governors’ Biofuels Coalition, is pushing to get an extension on ethanol tax credits. The Governor said he appreciates President Obama’s work. The Governor also is urging Congress to include in the final tax package the ethanol tax credits. A 25-year-old who grew up in Hiawatha, Iowa, was honored today with the nation’s highest military honor. Army Staff Sergeant Salvatore Giunta (pronounced JOON-tuh) is now a member of an exclusive fraternity of American war heroes. 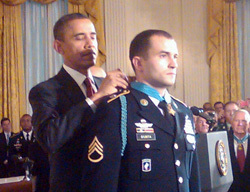 As President Obama noted during today’s ceremony, Giunta is the first living recipient of the Medal of Honor since the Vietnam War. A ceremony for Guinta and his family is being planned in Des Moines, at the statehouse, on Tuesday, November 23. It’s not just news in the United States. The BBC, The Canadian Press and Radio New Zealand all have stories online. The Hill posted a few of the tweets from famous folks like former U.S. Defense Secretary Donald Rumsfeld and the current chairman of the Joint Chiefs of Staff, Admiral Mike Mullin. Giunta’s hometown paper, The Cedar Rapids Gazette, has a gallery of photos from today’s ceremony.